Emily Rowley is just 23 years old and is a BKSA Instructor, she has been kitesurfing since she was 12 years old!!! Emily is a very very competant kitesurfer and can be seen out on some pretty knarly days at her local beaches in S.Wales.Her favourite place she has kited so far is Venezuala and Brazil where she spent 4 months teaching kitesurfing. 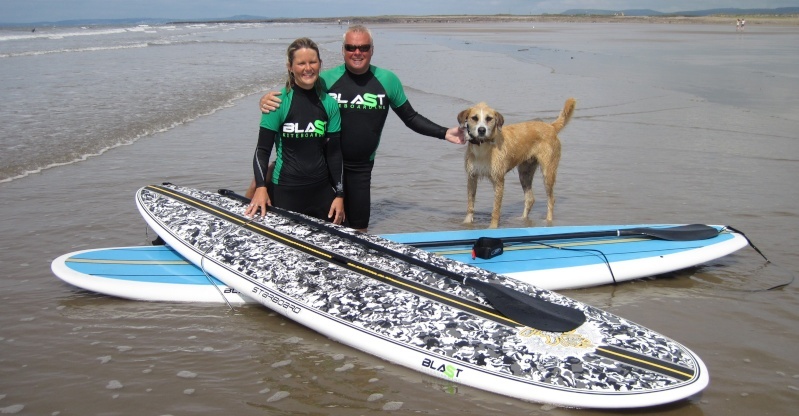 Marc Rowley has been kitesurfing/kiteboarding since 2000 and competed in many National events as well as organising events for both the BKSA as well as for the South and West Wales Kitesurf Club which he helped set up. Marc recently competed in the IksurfMag Wave Challenge and became British Champion for the 3rd year running (over 35), this is his favoured side of kitesurfing in the surf although he has also competed in Freestyle and Race at British level often placing in the top 3. He is an acomplished rider and has travelled extensivly kiting many of the best areas in the world such as S.Africa, Brazil, Morocco, Greece, Canary Islands, Egypt, Portugal, Spain, France, Sardinia,USA. Many of these have been group trips that Marc has organised, keep an eye on this website for more trips to folllow. As well as kitesurfing Marc is past British Champion Wave ski champion and competed all over the the world surfing (see pics below). He is also past Welsh record holder for 100m Breast stroke and again competed at internatiuonal level he also swam the English Channel and also acheived 4th in the British National Long distance championships. As well as instructing in Kitesurfing, Marc is also qualified in Snowboarding, waveski surfing and kayaking. Richard Webb is Marc and Sarah's right hand man...super enthusiastic and always up for a kite and a laugh too! Richie can usually be found lurking at the beach in the brightest coloured pair of floral board shorts and has a personality to match! Jon Reily is more often than not down in his beloved West Wales which makes him ideal for anyone wanting lessons down in Pembroke. He's a passionate wave rider and will always be seen using his strapless surfboard. Tom Butler has been kiting for over 8 years having bought his 1st kite from Marc and learning with him and the local crew in S.Wales, he has competed in the National BKSA competitions over the years and is now sponsored by Epic Kites as well as Blast Kiteboarding. Mark Walker had lessons just two short years ago and now is one of the main Instructors for the coming season. Mark has progressed at a extremely rapid rate and is lucky enough to get in the water most days it's windy....yup he's a jammy Fireman! Monty is the Blast Kiteboarding mascot but also protects the kit whilst on the beach, just don't leave your sandwhiches unattended! He is also known to answer to "for f*ck sake" !